One thing I like about Cameron is the weekly badminton games, held at the sports hall of Jurong West Sports and Recreation Centre, located just next to Pioneer MRT Station. So every Tuesday after work we take the one of the company buses which will drop us there and we play from 5pm to 7pm. Firstly, I feel so fortunate seriously, without this I couldn't have been able to play badminton regularly, and badminton is the only sport which I'm relatively good at. Secondly, those who play badminton know how costly it is to play badminton - the bloody shuttlecocks (approximately $30/tube). And having played under Cameron's recreation scheme, everything (booking fees, cost of shuttlecocks etc.) is beautifully covered by the company! Glory to God! 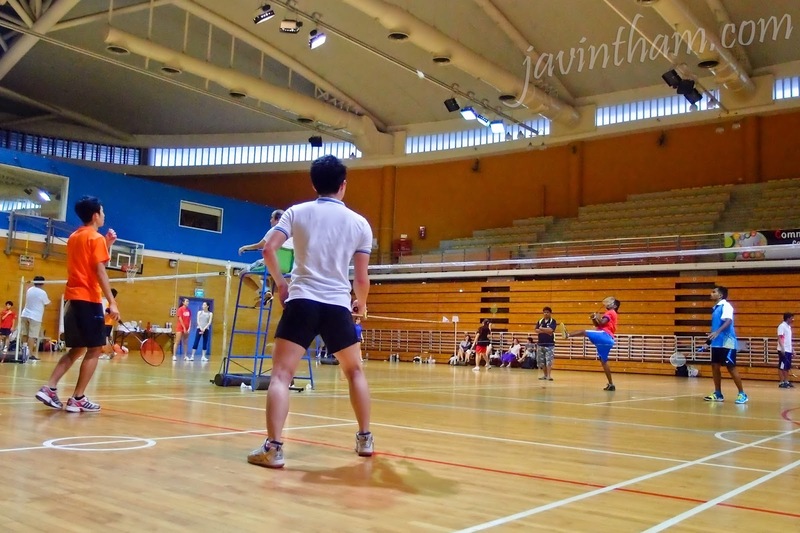 This year Cameron held it's annual badminton tournament on 19 October 2013 (Sat) 12pm to 5pm at Bukit Gombak Sports Hall where all Cameron Singapore employees are welcomed to join. I signed up, and my partner was Terry Tan, another 1st year GRDP. Every participant was given a bottle (1.5l) of isotonic drink, an apple and a towel. I love freebies!! There were 4 groups (6 teams in each group) of men's double and 1 group of women's double. I was the coordinator for group B, coordinating 15 preliminary matches (intra group). Question: Why are there 15 preliminary matches? There are 6 teams in a group, and any 2 teams play against each other. Number of possible combinations = C(n, r) = n! It's fair that every team gets to play at least 5 matches in the preliminary round, unlike some tournaments which disqualify you once you lose. The top two seeds in each group will play against the top two seeds in the other. Top seeds are determined by the highest number of winning matches (and by the total scores if two or more teams have the same number of winning matches). That happened to my group, but Terry and I were the top seed in Group B as we had the highest number of winning matches and total scores, so we play against the 2nd top seed of Group A in the quarter final match. It's close, but we lost in the quarter final match by a few points. However, we still have another round, called the 2nd tier final (sounds pretty nice though), where we played against the other loser of the other quarter final match, which we won pretty decently, fortunately. That won us a title - Champion (2nd Tier Men's Double). The title sounds so prestigious for its achievability, but the ranking was actually men's double 3rd runner up. It's been a while for me experiencing the ache that drives me to a wonderful good night sleep. Healthy ache moreover. You'll find badminton exciting when you are able to perform these techniques! 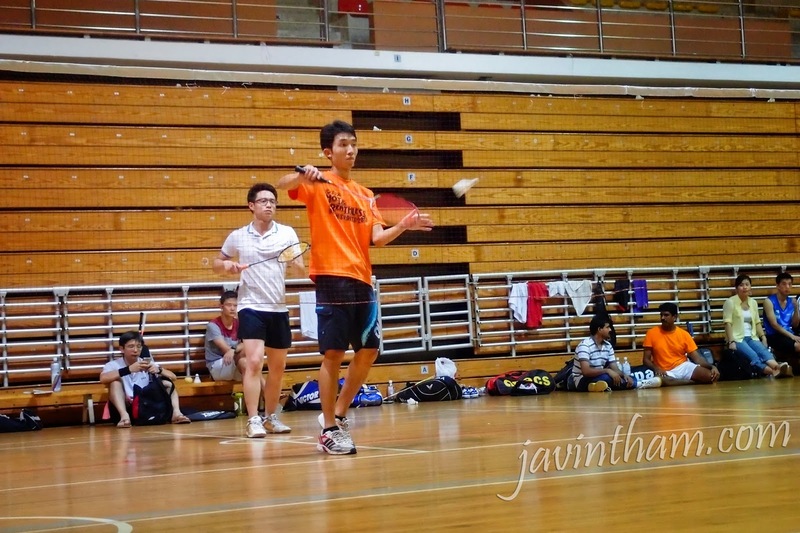 Learn the correct basics in badminton and practise them. When you possess strong basic skills, you will eventually develop advanced techniques by yourself. You'll find badminton exciting when you are able to perform these techniques! Learn the correct basics in badminton how to make money online and practise them. When you possess strong basic skills, you will eventually develop advanced techniques by yourself.